I recently found a piece of plastic that is a mash-up of some of the things I loved most as a child. Allow me to explain... As a youngin', I liked skeletons, things that glow in the dark, and toys. Of course, there were other things too but "pizza" doesn't really fit with this topic. My enjoyment for those three things never diminished through the years and in some ways evolved. Not too long ago I was introduced to the wonderful world of vinyl art toys and customizable "blank" vinyl toys. Since then, I've been fond of artists who can create great and unique works from blanks such as Munnys, Dunnys, GWINs, and the myriad of other toys available today. 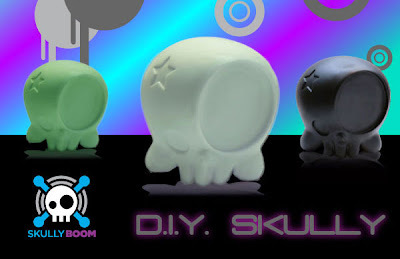 Enter Skully, a blank vinyl toy that resembles ...wait for it ... a skull! Currently available in white, black, and glow-in-the-dark; Skully appealed to me right away. I immediately recognized a familiar dead guy when I first laid my eyes upon Skully. In fact, I was inclined to paint my first custom vinyl toy. 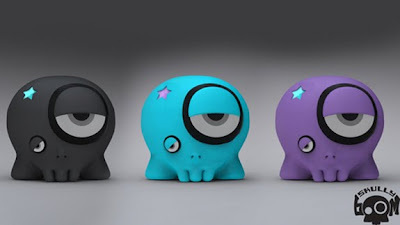 Not content with just leaving the vast world of customizing to vinyl toys, SkullyBoom has taken their design to a new level by adding a practical application. Adding the "boom" to Skully by implanting speakers and the ability to connect your favorite sound source is only the beginning. SkullyBoom's SB1 speaker is not only available in several colors, but there are also several different speaker grilles to allow further customizing. Head over to SkullyBoom to create your own unique portable speaker. And for those interested in customizing one of the PVC Skullys, head over to the Zombie Toy Store. I love the Zombies and toys logo skullyboom!!!! Thanks! It's my first custom.